To smooth concrete slabs, precast planks, or steel deck use Dura-Cap®. 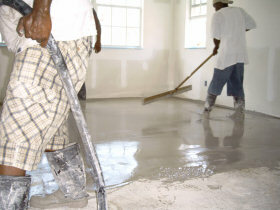 It's formulated to cap rough, pitted, cracked and out-of-level concrete. In renovation projects, it can be poured directly over old tile and adhesive residue. Gyp-Crete 2000/3.2K and Dura-Cap can also be used over a special encapsulant to abate vinyl asbestos tile. Consult your Maxxon dealer for more details on this safe and extremely cost-effective method of abatement. Now offered in a "Green" formulation, Dura-Cap is an ideal solution for sustainable building projects.